Now that summer is officially in high gear, we went searching for the perfect libation to help get the season in full swing. We turned to our man Ori Geshury at Cherry Hill’s Mixology Wine Institute, and he had just the cocktail we were looking for: the Paloma. In recent times, tequila has taken on a whole new level of sophistication, but Geshury points out this drink is deeply rooted in Mexican culture. “This is, after the margarita, the most popular drink in Mexico,” he says. Put ice, lime juice, tequila and salt in a Collins glass. 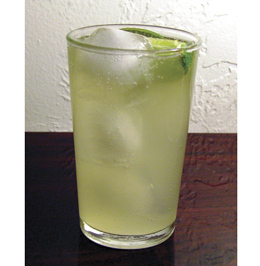 Then fill up with the soda (you can substitute lime soda with some grapefruit juice if you are unable to find Mexican soda), and garnish with a lime wedge. Beer lovers return to the Battleship New Jersey on June 18 for the annual Garden State Craft Brewers’ Guild Beer Festival, from 1 to 4 p.m. Sixteen state breweries, including locals Flying Fish and Iron Hill, will be pouring, and food and specialty vendors will be on hand. The cost of the ticket ($45) also includes a self-guided tour of the ship. Visit NJBeer.org for more information. The Borgata has plenty of fine dining options, but now they are getting into the wine world at their neighboring property, The Water Club. This month is the expected debut date for Vintage, a new wine boutique featuring a couple hundred bottles, accessories and more. Take a step back in time on June 10 when the Perkins Center for the Arts hosts A Toast to the Past at the Moorestown Community House. The event will feature a beer tasting of some historic brews from the early 1900s, live ragtime piano and a beer history presentation. Tickets are $50 and proceeds will support upgrades to the center’s buildings and various arts education scholarships. Visit PerkinsCenter.org for further details. Hammonton’s Tomasello Winery is hosting their second opera gala of the year, Totally Tenors, on June 12 at 2 p.m. Guests will be treated to live performances from top names in the industry, as well as a four-course meal and, of course, wine. Tickets for the four-hour event are $65. Visit TomaselloWinery.com for more on this event. Published (and copyrighted) in South Jersey Magazine, Volume 8, Issue 3 (June, 2011).